Google good, Facebook bad. 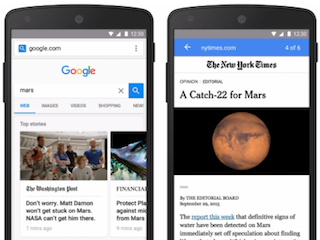 That’s what some publishers believe after having used Google’s AMP (accelerated mobile pages) and Facebook’s Instant Articles. According to Digiday, AMP now accounts for 10 to 15 percent of publisher search traffic. That’s insane. The main reason? AMP-enabled links are lightning fast, so people use them. Thrillist said AMP provides 15 percent of its search traffic; USA Today said it generated 12 percent of its mobile views; and The Verge put it at about 14 percent. “For AMP to almost immediately climb to this 10 to 15 percent number as a contributor to the overall search pie, as a product goes, it’s almost unprecedented,” Shahzad Abbas, vp of digital media at SEO consulting company Define Media, told Digiday.